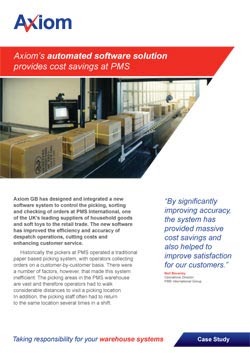 Effective logistics software is fundamental to the success of any warehouse automation project. In our experience, warehouses are organic; they are living things, evolving to meet the challenges thrown down by daily business. Problems faced by the warehouse operations team can be exacerbated by poorly designed and implemented software systems. Businesses often make choices for systems based on their overall requirements, sometimes at a global level. Commonly, localised warehousing requirements are thus ignored or can't be catered for by the generic global system. At Axiom, we recognise such issues. The ethos of our systems engineers is that we must supply systems that work for the business, not the other way round. Where we can see obvious benefits to the business/operation, we will make recommendations to change working practices. We will always be led, however, by your warehouse team. They best understand the day to day running of the operation. All too often, boxed WMS systems have been developed by software engineers in isolation to operation staff. Our modules are designed to operate in a paper based environment or utilise the latest wireless based handheld technology. The systems are controlled via a web browser interface making them platform independent.